A bold statement considering that this is the first time I’ve attended the event after 10 years of working in digital marketing. It’s an informal affair, full of like-minded people wanting to take their knowledge of search marketing to the next level. So what’s not to love? Yes, as with all events of this nature, there were sponsors and an exhibitor’s hall, but this rarely crossed over into the talks, and the pitches from most of the exhibitors were relevant and informative. That's right, no hard sales pitches here! Thanks for the cocktails and chat though, SEMrush! Good job the drinks were AFTER the seminars on machine learning! We also had the great opportunity to network and share our own experiences with other search marketers by destroying them over games of Smash Bros, Perfect Dark and Mario Kart (we stuck to what we knew after an embarrassing few losses at Mortal Kombat!). This relaxed atmosphere gave us the chance to bond over something other than SEO and to give our minds a slight rest between some very intense seminars. An entirely accurate representation of us attempting to play Mortal Kombat! On the topic of seminars, both myself and Mark (SEO & PPC Executive) split up to ensure we covered as much ground as possible to bring some actionable insights back to the office for the rest of the team and our clients. It’s one thing attending these events, but being able to pick through the presentations and change your way of working is another thing entirely. 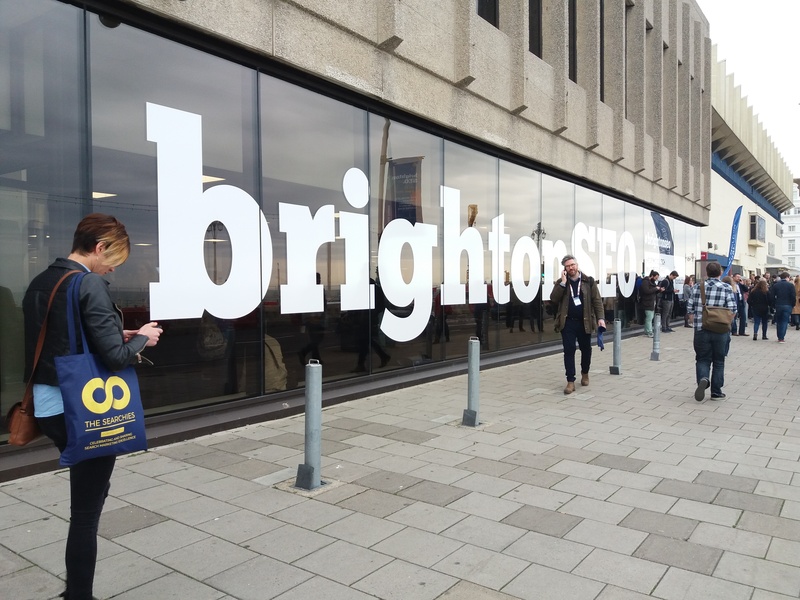 This is something we both wanted to make sure we achieved following our time in Brighton, so I tried creating a small summary for those of you who want to improve the performance of your site in search results. The main reason it's taken so long to get this blog post live! There was a LOT of information shared over the course of the day and I’ve tried to condense some of the most beneficial insights into concise bullet points. If you have any questions about this information, let us know and we can talk you through it. Let’s move away from the perception of SEO being a “dark art”. Time for the good bits. It's the quick-fire round, so I'm not going to go into too much detail here, but I'm happy to explain further via email. If you want your website to perform well in search results, make sure you bear the following points in mind. If you perform any form of content marketing, you can prove you are the original author by creating a record on po.et. This requires a bit of setup and technical knowledge, but allows you to authenticate and manage all of your digital assets on the blockchain (if you aren't sure what that sentence means, just know that it's good)! Luckily there is a wordpress plugin to help make everything a bit easier for many users. There has been a marked improvement in click-through and conversion rates when you optimise for your buyer persona’s emotional goals instead of stating the benefits of your product/service. A website has less than half a second to make a first impression. If you have a high bounce rate make sure you run experiments to test the images, colour, layout and headings. These visual elements are what gives your user the very first impression of your brand before they even read any text, so get testing! Universal ranking factors no longer exist. If you want to rank, look at what other people in your industry are doing. For example, video works well on fitness sites, but not as well on wine sites. Keep a VERY close eye on your competitors. If you’ve produced a lot of content over time, ensure it is all of the same tone. What is your brand’s tone of voice? Ensure that your content isn’t too sales-focused and instead you understand your user's search intent and help them achieve their goals. The average page load speed has reduced by two seconds over the last two years. It’s likely other businesses in your industry are focusing on reducing their page speed, so make sure you jump on it as well. Posting less frequently can be beneficial. Spend the time creating one great post instead of creating multiple low-value posts. Does every page on your site provide value on the current date? If the page no longer provides value or you wouldn’t post it today, either update, merge or delete it. Google looks at 100% of your content to identify the quality of your website. Stop looking at the top 20% of your blog content and instead look at how to manage the lower 20%. Break up your content with images to help improve the level of engagement. If you've managed to read this far it seems to be working. We did learn a LOT more than this over the course of the day; this is just a snippet of the information that was shared over the day. If you’re interested in learning more about how to optimise your website for search engines then either get in touch or head down to one of our local events. It was definitely worth waking up at 4:30am for it.